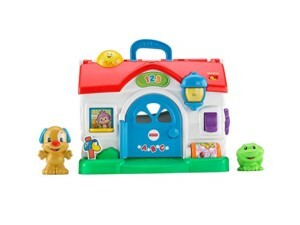 Teeny-tiny ones can shake, rattle and roll (and bat, clack and teethe) their way to sensory and skill-building fun with the Fisher-Price Music Makers Gift Set. 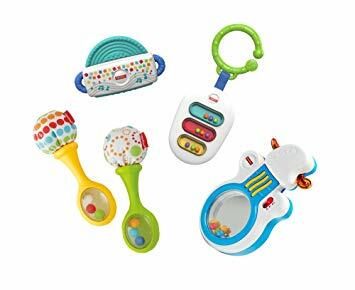 These 5 musical activity toys are just the right size for little hands to grasp so baby won’t miss a beat. So go ahead, baby, make some noise whether you’re at home or on the go-go-go! Rock ‘n Roll Guitar has a roly-poly base to bat at for fun tunes and “strings” to press for rockin’ music and guitar riffs! 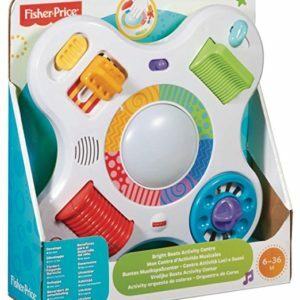 Shake ‘n Beats Tambourine engages and entertains baby with its bright colors, click-clack sounds, shiny mirror, and roly-poly base. Harmonica Teether is super soft with a chewy mouthpiece and fun sounds when baby gives it a shake. Rattle ‘n Rock Maracas feature soft pom-poms and colorful rattle beads in the handles for baby to shake, shake, shake! 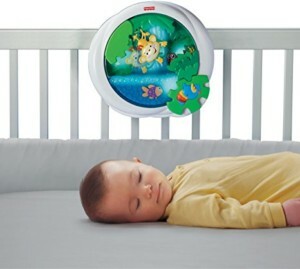 Xylo Rattle is easy for baby to grasp and shake, with fun rattle & squeak sounds and a link to take the music on the road!